May is “Healthy Vision Month,” a good time to celebrate the past accomplishments of scientists and clinicians in advancing vision health and to draw attention to the importance of the sense of sight. Here is a simple exercise for activists with such shortsighted beliefs — one that I hope will help open their eyes. Simply blindfold yourself for one day and go about your daily routine (but please, don’t drive). I am not asking for much; go blind for just one day in your life. In the process, you will surely learn what is that you take for granted every day and gain a deeper understanding of the impairments that come with vision loss. 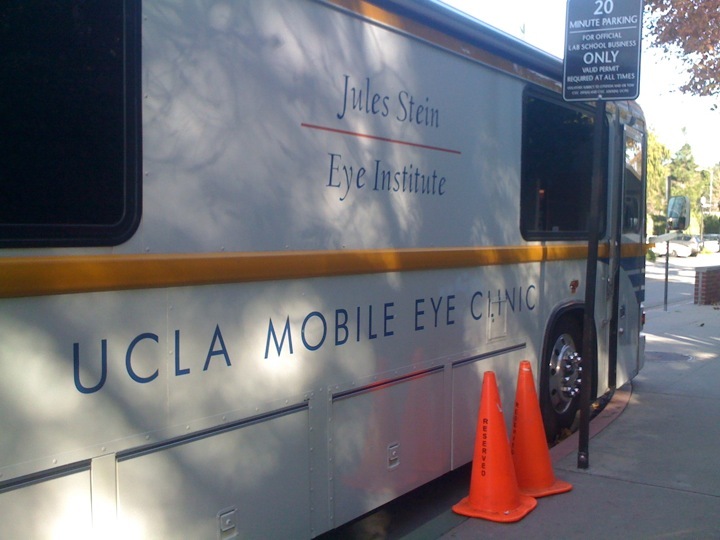 The UCLA mobile eye clinic screens thousands of children for vision problems at schools every year. During Healthy Vision Month, the National Eye Institute (NEI), part of the National Institutes of Health, encourages people and organizations around the world to recognize the value of the sense of sight and make vision health a priority. In focus groups conducted by NEI in 2005, the majority of participants reported that though they consider eyesight to be important, they take it for granted. In surveys conducted the same year by the NEI’s National Eye Health Education Program and the Lions Club International Foundation, American adults noted that the loss of eyesight would have an extreme impact on their daily lives — though more than 25 percent said their last eye examination was more than two years prior, and 9 percent had never had an eye exam. Unfortunately, an estimated 14 million Americans are currently visually impaired due to eye diseases and disorders, and this number continues to grow as the population ages. Of adults aged 40 and older, more than 4 million currently have diabetic eye complications, more than 2 million have glaucoma, and more than 1.75 million have age-related macular degeneration. Millions of Americans have common, correctible vision problems such as nearsightedness, farsightedness, presbyopia, and astigmatism. The prevalence of nearsightedness alone has increased 66 percent in the past 30 years, according to a 2009 NEI study. Recent investigations by NEI scientists have indicated that many eye diseases impact certain races and ethnicities more often, a key observation for eye care professionals and for members of the general public who have the ability to take charge of their eye health. For example, African-Americans have about a 12 percent risk of glaucoma, which affects peripheral vision. This is more than twice the risk of non-Hispanic white Americans. Both Asian-Americans and Hispanics have a risk of about 6.5 percent. Another major NEI-supported study recently determined the first estimates of visual impairment and eye disease development in Latinos, the largest and fastest-growing minority population in the United States. Researchers found that Latinos have higher incidence rates of visual impairment, blindness, diabetic eye disease, and cataracts than non-Hispanic whites. The same scientists previously showed that more than 60 percent of eye disease in Latinos remains undiagnosed. The best way for any person, regardless of their ethnicity, to detect vision problems at the earliest, most treatable stages, is through a comprehensive dilated eye exam. This simple, painless procedure allows an eye care professional to examine the eye through an enlarged pupil and gain a more complete look at any changes in eye health. Comprehensive dilated eye exams can reveal common and correctable refractive errors as well as eye diseases that have no or few early warning signs, including diabetic retinopathy, glaucoma, and age-related macular degeneration. Early detection of risk factors for these and other blinding eye conditions can lead to earlier treatment with vision-saving therapies that NEI researchers have developed over the past decades. For example, scientists have shown that laser therapy is effective in preserving sight in those with diabetic eye disease, and recent studies indicate that additional drugs may lead to even better vision. Another study revealed that high levels of antioxidant vitamins plus zinc reduce the risk of the progression of and vision loss from age-related macular degeneration. Researchers also found that eye drops used to treat high eye pressure reduced the development of glaucoma by more than 50 percent in people who are at a high risk for the condition. Join NEI in making vision a health priority for the nation. To find more information about Healthy Vision Month and resources for raising eye health awareness, including e-cards, educational handouts, and teaching tools, visit <http://www.nei.nih.gov/hvm>. For additional information on eye diseases and disorders, visit <http://www.nei.nih.gov/health>. As you might expect animal research plays a key role in the development new treatments for blindness, recent examples include the use of gene therapy to reverse a form of childhood blindness called Leber congenital amaurosis and the development of the monoclonal antibody treatment lucentis for wet age related macular degeneration. Happy Healthy Vision Month everyone! Posted on May 16, 2011 April 14, 2014 by darioringachPosted in Animal Rights News, SR NewsTagged animal research, animal rights, blindness, healthy vision month, National Eye Institute. Next Next post: A paralyzed man stands again…thanks to animal research! Very cool, thanks for sharing that Glenn! As it happens scientists in the Schepens Eye Research Institute at Harvard University have today reported promising results with some early studies in mice of repairing degenerated retinal tissue with iPS cells.